My family and I dressed up as Dickens' classic - A Christmas Carol. 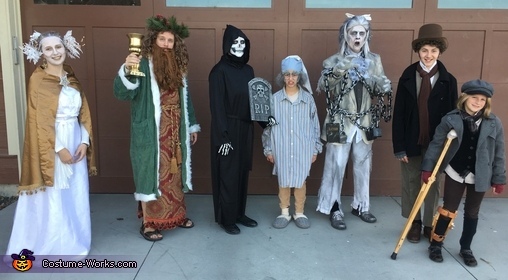 From left to right, we have the Ghost of Christmas Past, Ghost of Christmas Present, Ghost of Christmas Future, Ebenezer Scrooge, Ghost of Jacob Marley, Bob Cratchit, and Tiny Tim. Most of the items used we got from thrift stores, so the overall cost wasn't too bad.